It's now late october and every night our water is still being turned off from after 8pm to around 6:30am. The pressure doesn't fully restore until about 7am. I'm lucky we have 2 showers in the house, because the electric shower doesn't work with the low water pressure, so I have to use the other one which takes water from the immersion. I'd be screwed in the morning otherwise. I wonder how many other families in my area aren't able to wash themselves before work because of it. I wonder at what stage the nearby reservoirs will return to normal levels or if this drought will continue well up to december, we haven't gotten much rain at all even in the last month. Scary to think what might happen if we don't get some, and this could happen next year too. It would appear that since the end of the hot/heatwave we had during the summer, the rainfall deficit issue - at governmental/local authority levels - has become less of a priority. The rainfall deficit that was there during the hot period remains because rainfall amounts since the end of the heatwave remain below replenishment thresholds. A historical record of selected Irish stations' Summer rainfall totals (mm) from driest to wettest. *Notes there is missing data in these totals so not reliable. This is not my final stats on the matter as I have more stations to do including climate ones which have only released June data up to this point so have to wait for July and August to come in. 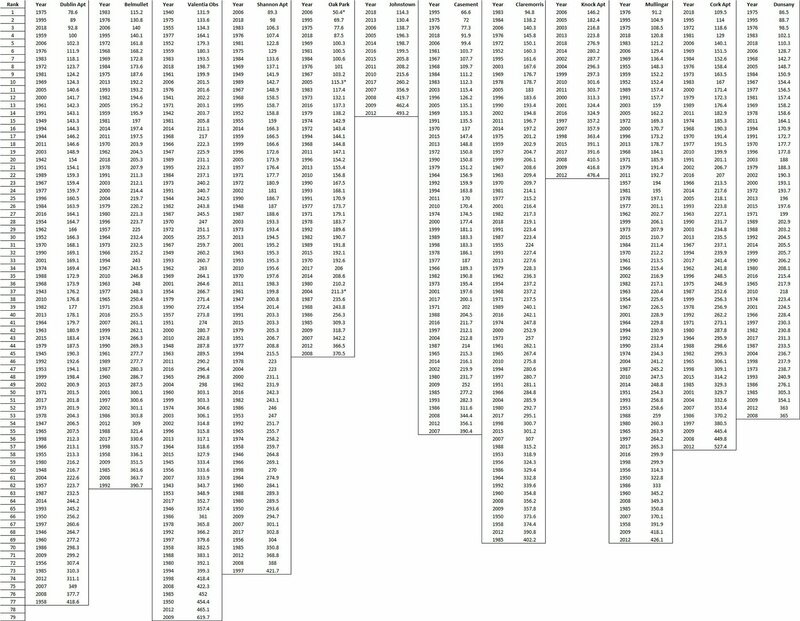 If you find this hard to read or want the file for yourself, I have attached the excel file. A quick and final look at the rainfall patterns this year. Seems we have now made up for the lack of rainfall during the summer as the last part of the year finishes much wetter than average. Chart below shows the 28 day running rainfall percentage of average at a national level for the 2018. After all the swings from floods to drought we reached 102 % of the normal yearly rainfall today in Kilkenny, according to kilkennyweather.com. It's a bit like an end-of-year balancing statement! Last edited by inthehat; 24-12-2018 at 17:34. Extending the hose pipe ban is a joke. Wait + see we will probably get the wettest Sep or Oct now. In fairness no one needs to use the hose pipes because plenty of rain in gardens now! A 3 month hose ban in a country that gets as much rain over the year as we do is an absolute joke. Yes we know we had the drought for few weeks but rain was above average in Dublin for March + April. There is enough water if they coped on + fixed the leaks + stored it properly. Surprise surprise as I predicted the rain came! A joke that we had all those restrictions on water in summer. Yes we had a dry period but overall we get plenty of rain in Ireland. In Europe used to months of no rain + no bans + they get hardly any rain compared to Ireland. We just need to store it better.